The Newfoundland railway operated for a little over a century. From 1882-97 the trains ran over completed portions of a projected trans-insular line. 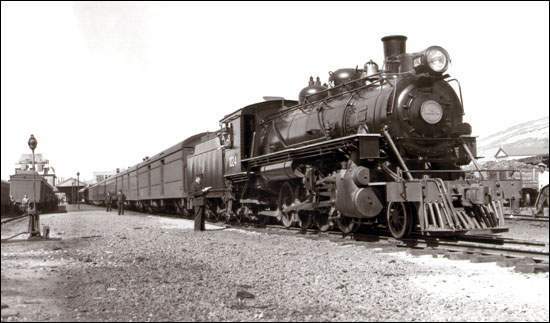 The first passenger train across the island ran in June 1898. Regular passenger service ceased in July 1969, and the last freight ran in June 1988. The railbed has since been designated a "T'railway" and a linear provincial park. Built to narrow (3'6") gauge for reasons of economy, the Newfoundland railway was the longest such line in North America, and was regarded with particular affection by railway buffs (its gently mocking nickname, "the Newfie Bullet" dates only from World War II). The main line was 548 miles, from St. John's to Port aux Basques. Numerous branch lines made the operating trackage in the peak years (1915-31) 906 miles. 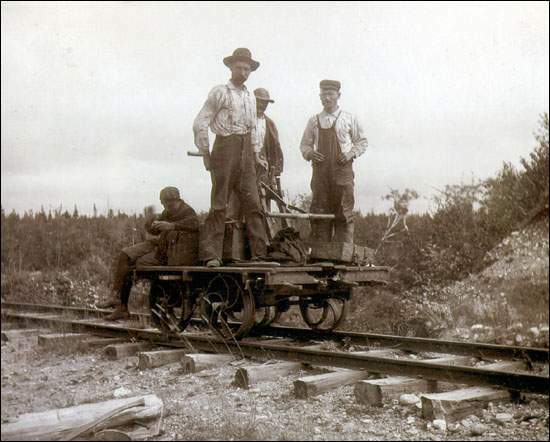 Foreman Billy Best and sectionmen on a pump car, probably near Port Blandford. From the A.R. Penney Collection. Courtesy of Harry Cuff Publications. Of course, the railway has a particular mystique for Newfoundlanders as well. The line connected the major bays to each other, and the old headland "fishing capitals" to the new towns of the interior. The railway provided substantial employment and created a brotherhood of railwaymen as well as a network of railway families. It also provided the first overland link to the mainland. The saga of the line's construction across the interior and its continued operation in the face of enormous difficulties was a source of national pride in Newfoundland. After Confederation with Canada in 1949 the railway continued as a symbol of Newfoundland's former independence. The construction era figures in our history much as the building of the great trans-continental lines does in the history of Canada and the United States: as both a milestone in the march of progress and an exercise in nation-building. Although the first construction contract was let in 1881, it was not until 1890 and the advent of contractor Robert Gillespie Reid (1842-1908) that the line extended beyond the Avalon Peninsula. The Reid family ran the railway until 1923, when operations were taken over by the Newfoundland government. Canadian National Railways assumed operations in 1949 under the Terms of Union between Newfoundland and Canada. For a century the railway was a major policy issue in Newfoundland. A line of such length, across such an underpopulated country, could never operate without steady infusions of cash from the public purse. In addition to the general scarcity of traffic, there were two systemic problems which harkened back to the construction era. The decision to build a narrow-gauge line had lasting implications for carrying capacity and freight costs. Further, the decision to build a line across the high barrens of the Gaff Topsail plagued winter operations. But there were also crucial junctures in Newfoundland history when the railway proved its worth: the beginnings of the pulp-and-paper industry in the early 20th century, during the two world wars, and the post-Confederation boom years. The railway did indeed fulfill some of the ambitions of its earliest promoters, as a "development road." The line and associated developments in heavy industry, transportation and communications were key to developing the forest industries of Newfoundland, mining and hydro-electricity. The railway itself, and attempts by the Reid family to encourage development of the lands awarded under various operating contracts, not only made the vast interior known but further made the potential of land-based resources a staple of public policy. Last steam locomotive built for the Newfoundland Railway by the Montreal Locomotive Company. It was scrapped by CN in 1957. The railway gave Newfoundland a "new" interior region and its first towns "out of sight and sound of the sea," from Whitbourne to Deer Lake. It also gave the older population centres of the east coast an expanding hinterland. Like its North American neighbours, from 1898 Newfoundland had a West. Completion of the railway contributed to the settling of French Shore issue, opened the west coast to further settlement and provided a tangible link with the rest of the country. The early chapters in the story of the rise and fall of the Newfoundland railway in many respects mirror the pattern in Canada and elsewhere: initial enthusiasm; the emergence of a political champion (the "apostle of progress", Sir William V. Whiteway (1828-1908)); generous government support and controversial land-grants; ill-planned expansion; and the centrality of the "railway question" in politics. And the same, perhaps unanswerable, questions emerge. Did the railway achieve its promise for Newfoundland? What is the balance between the ideal of progress and the expenditure of so much public money? This last is of particular moment in Newfoundland history in light of the suspension of responsible government in 1934, when the country was unable to service the public debt. Did the railway, then, contribute to Newfoundland's loss of independence in 1949? 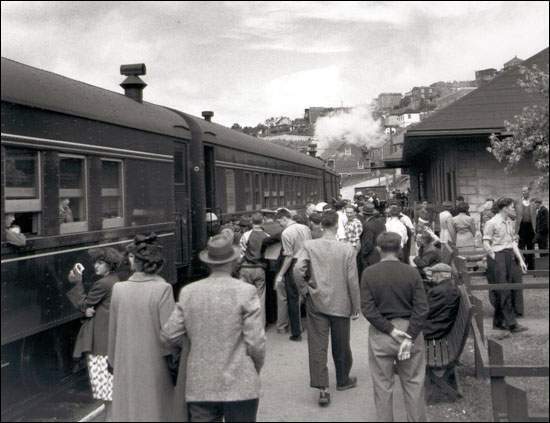 A passenger train arrives at Corner Brook Station, n.d. Boosters of the railway had long pointed to the line as a necessity for Newfoundland. Its construction was proposed as "the work of a country," a line that would lessen the island's historic dependence on the fishery and create a modern economy driven by land-based resources. Opponents saw the line as a ruinous expense and indeed as a stalking-horse for Confederation with Canada. A closer examination of the history of the Newfoundland railway can only lead to the conclusion that each vision had some merit. For other Railway related articles view the Economy Table of Contents.